The first weekend of November I took a trip to the city of Granada, a city in the southern Spanish region of Andalucía and nestled up against the Sierra Nevada (“Snowy Range”). I know, I know, I’m writing this post about a month after the fact, so forgive me. Anyway, in the future I’d like to use these travel posts to talk about the highlights of each place I visit—not every emotion I felt or food I ate or street I walked down but the main things to see and do in town. I hope these will be concise yet interesting for future travelers (be they backpackers or armchair travelers). 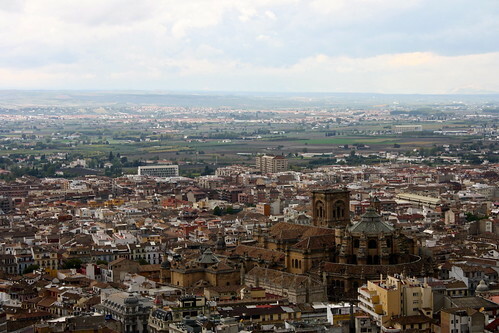 In the center of the city are the Catedral (“Cathedral”) and Capilla Real (“Royal Chapel”). 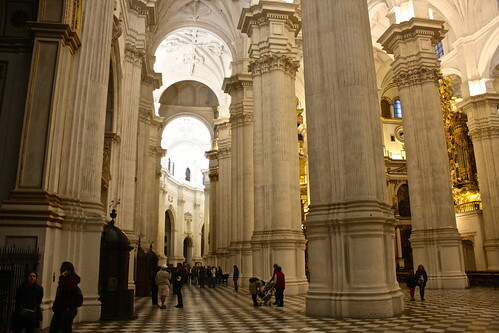 Even if you’re not Catholic or even religious, I think it’s always a good idea to stop by the major cathedrals in cities you visit in Spain because they give you a closer look into the country’s history and culture; often they are veritable museums. For example, Granada’s cathedral was built in the Renaissance style of architecture, but it might have been constructed as a Gothic one (like Notre-Dame in Paris) had the city been (re-)conquered earlier than 1492. In the Royal Chapel are buried the Reyes Católicos (“Catholic Monarchs”), better known in English as Ferdinand and Isabella. Yep, the same Ferdinand and Isabella whose marriage united the crowns of Castilla and Aragón to form the kingdom of Spain; who financed Columbus’ journey to the Americas; who completed the “reconquest” of the Iberian peninsula, which ended when they got Granada; and who attempted to enforce religious purity by expelling all the Jews and Muslims from the country. Beneath the lavish Gothic mausoleum rest their plain, lead coffins. It was a very surreal experience to pass by the resting place of two of the most important figures in Spanish and world history. 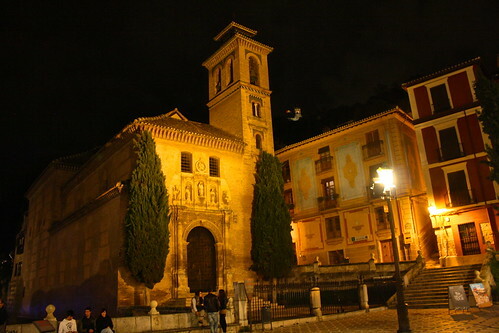 To the north of downtown Granada is a neighborhood built on the side of a hill called the Albaicín. Before the 16th century, it was the quarter of the city where the Muslims (Moors) used to live, and today—perhaps because of tourism, perhaps because of immigration—there are dozens of Moroccan-style restaurants, tea houses, and markets among the Albaicín’s many winding streets. One night, Ashley and Reina—friends of mine who also visited the city that weekend—and I were walking through this neighborhood’s main street when it began to lightly rain. I think it was at this point that I realized how true many of my Spanish friends were when they called the city “magical.” The air was fresh and slightly warm, and even though there were a lot of people walking to and fro, it was remarkably quiet. 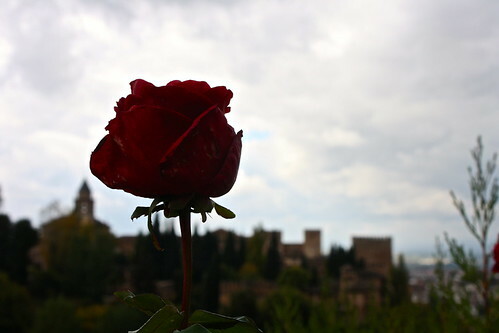 When I looked up to the right—bam!—there was the Alhambra castle, illuminated in reds, oranges, and yellows. We decided to stop off at one of the many North African-themed tea houses in the area. I tried té marroquí (“Moroccan tea”) and was surprised at how tasty it was. It’s a mix of green tea, sugar (heh), and spearmint, but the sugar really brings out the fresh, fruity flavor of the mint leaves. I now try to make a poor imitation of this at home at least once a week. 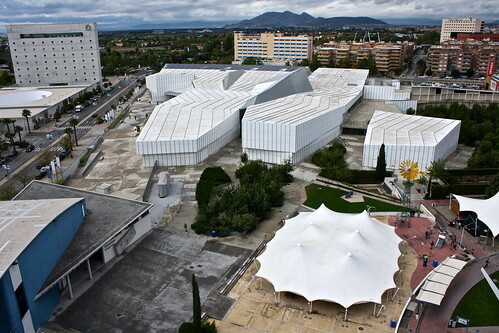 I had no idea Granada even had a science museum (“Park of the Sciences”), but my friends were saying it looked like a really cool place to visit so I agreed to go. I didn’t leave starstruck like I did from the Alhambra (see below), but I enjoyed this relatively-recent addition to Granada’s offerings. In the middle of the whole museum complex is a tall tower with an egg-shaped observation deck. 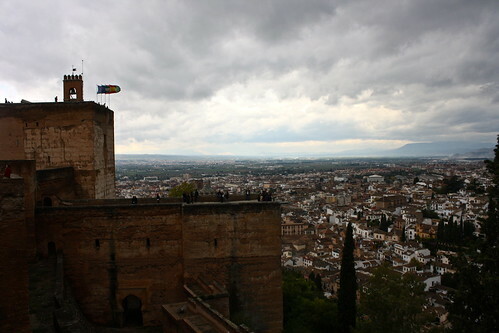 We went up the elevator and were treated to great views of the city center, the Alhambra, and all the nearby suburbs. Granada is big, y’all. Probably my favorite part of the whole park was the planetarium. We entered into a dark, circular room and sat down on these really comfy seats that reclined waaaaay back. Once it was time to start, the lady who was narrating the show turned out the lights and started talking in the most soothing, calming Spanish as she initiated the star show. She showed us constellations like the Big Dipper, Orion the Hunter, and the Zodiac. I was really disappointed that it ended after only half an hour because it was so incredibly relaxing. While wandering around central Granada, I came across a local Burger King chain and had to stop off for a quick bite. I don’t eat fast food that often back home, but I think it was the combination of not having eaten any fast food for a month plus the novelty of an American restaurant in Spain that drew me in. 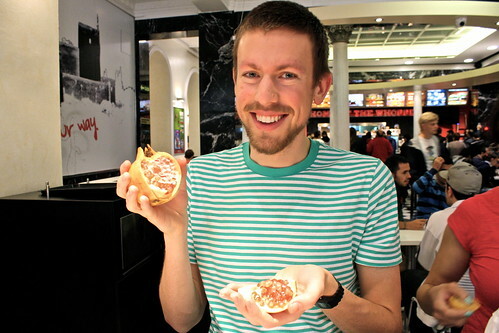 The burger itself really wasn’t all that great, but it was fun trying out American food abroad. Visiting Granada, I was probably most looking forward to strolling through the palaces and citadels of the Alhambra, a complex built up over successive centuries by Muslim and Christian rulers alike. In the hostel I stayed at, I met a Brazilian novelist named Thiago who was living in Madrid for a spell. After talking, we realized we were both going to the Alhambra the next day, so we decided to get up super early and hike across town to visit the site together. After all, the ticket stand opens up at eight in the morning, and there’s only a limited number of tickets for the protected area of the monument. The next morning, we got tickets and headed straight for the Palacios Nazaríes (Nasrid Palaces). 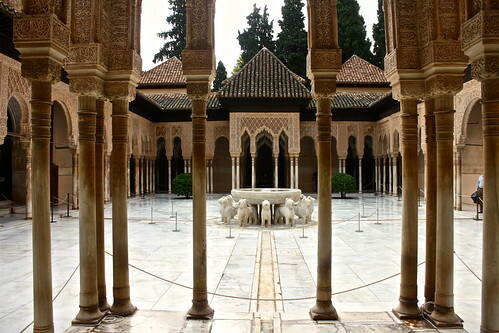 Although they’re only one part of the whole complex, the Nasrid Palaces come to mind most often when people think of the Alhambra: the lavish palatial residences constructed by the Moorish kings (Muslims from North Africa) of southern Spain in the 14th century. Walking through the halls and patios, I experienced Florence syndrome on a small level—the endless walls covered in intricate, perfectly-designed geometric and nature patterns dumbfounded me; I even got lost trying to get out. Still, as I passed through these many rooms, I concluded that I could get used to such a royal residence were I a king. It doesn’t surprise me that Ferdinand and Isabella wanted to move in after conquering the Kingdom of Granada in 1492. Outside was the Palacio de Carlos V (Palace of Charles V). This is a perfectly-proportioned Renaissance building constructed during the reign of, you guessed it, Holy Roman Emperor Charles V (Charles I of Spain). There was a Museo de Bellas Artes (Museum of Fine Arts) free for European residents on the first floor, but I didn’t feel like paying the nominal entrance fee so I wandered around for a few minutes before heading out; I just wasn’t that excited about it. Like the cathedral part of the Mosque-Cathedral in Córdoba, this palace felt out of place among all the other Moorish-era architecture. The Alcazaba (“Fortress”) was at the far southern end of the Alhambra complex and in the past served as a military installation. After the Nasrid Palaces, this section was one of my favorites. The pathways guide you from tower to tower until you reach the Torre de la Vela (“Tower of the Candle”), the highest point of the monument from which you can see the entire city of Granada. Granted, it was really windy, but the views were comprehensive and it was fun seeing places I had visited days previously like the Parque de las Ciencias, the cathedral, and even a lookout point in the Albaicín neighborhood. According to the official site map, the Generalife was a palace and set of gardens for the kings of Granada whenever “they wanted to flee from the official life of the palace.” The name comes from the Arabic Jannat al-‘Arif, which means “the architect’s gardens.” The Lonely Planet guidebook calls this a “coda to most people’s visits,” which I think best describes it. After the aesthetically-overwhelming Nasrid Palaces, the Generalife (pronounced [xe.ne.ɾaˈli.fe] “hay-nay-rah-LEE-fay”) was a pleasant set of gardens and rooms built in a similar style to the rest of the Alhambra below. In the end, I left the city not disappointed at all; my expectations were fully met! If you ever get the chance to visit Spain, make an effort to stop by Granada on your way from Barcelona to Madrid. 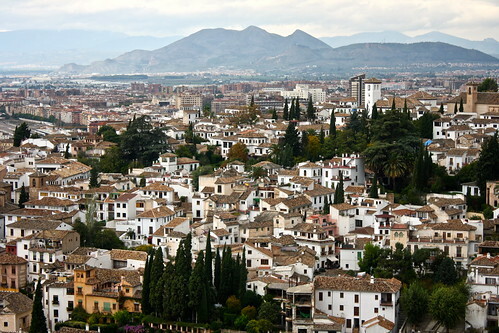 Question: If you’ve visited Granada before, what was your favorite part of the city? 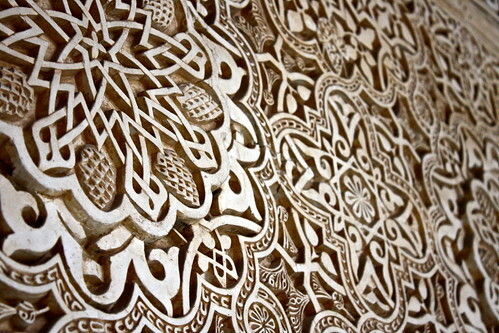 Were you awed or blah’d by the Alhambra? Talk about it below!